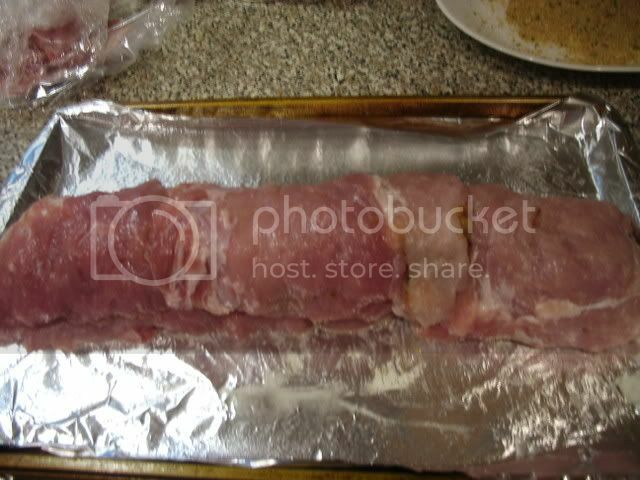 Pork is still pretty reasonable..
Loin of pork on sale for 1.59 a lb....no waste, and you have the makings for a an economical, and delicious dinner..if you like pork, that is..
We do...so tonight I took a boneless pork loin, butterflied it, and pounded it out at flat as I could. Make you favorite recipe for stuffing. 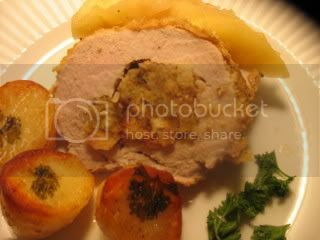 Roll in an egg wash, then bread crumbs..
Place the pork on the pan, put a few pats of butter on top or drizzle with a bit of olive oil..
Bake till browned...depending on the size of your roast.. I served ours with tattooed potatoes ( toss peeled potatoes in a bit of evoo, s&p. I made a compote with sliced apples, chopped onion, s&P, and a few ounces of Apricot Liqueur..inexpensive brand I use for cooking..
And since you saved a few pennies on an economical dinner...(really it is! 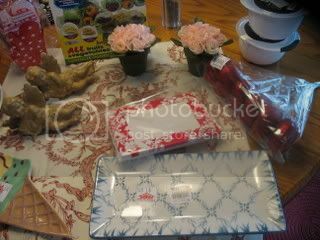 ), you can go bargain hunting at Home Goods, Christmas Tree Shops or WmSonoma outlets..
From the other places mentioned...I think you can read the prices..
You can see the napkins used here..
Kathleen, I am heading to LI for leftovers! 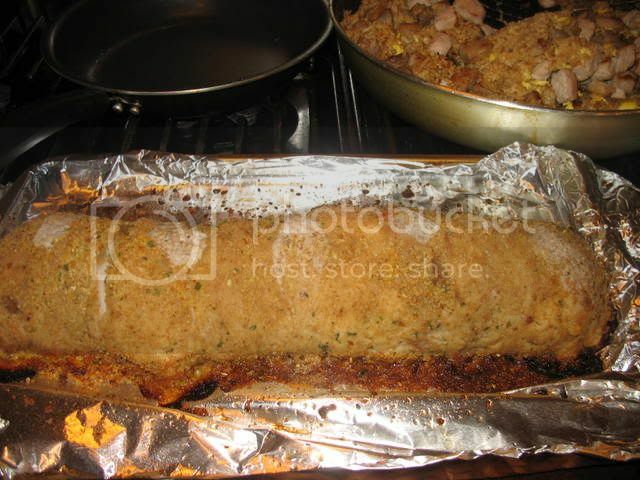 I love stuffed pork loin, AND your choice of dishes. I'm heading to Homegoods and CTS this weekend, well actually I'm dragging Joe there after we do a shopping spree at the Finger Lakes outlet mall for his birthday. Truly, your meals are among my very favorites. Thanks for sharing, you give me so many ideas. I love those tattooed potatoes! What a great idea. 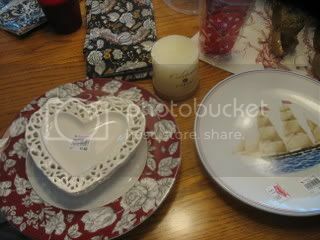 And you got some neat stuff...love the napkins & the pierced hearts! My! That pork roast sure looks good! I am going to try it next week. 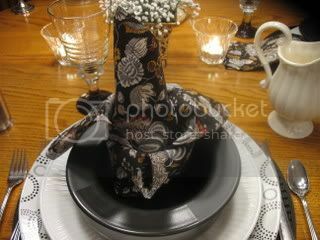 Also, would you share the napkin fold you show in the last picture? It looks beautiful. 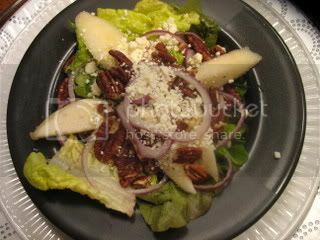 Kathleen, pears, feta, and pecans sound like a great combination. I love the tattoo potatoes. What a great way to a make a potato special. from top to bottom, just perfect, good food, lessons and shopping, excellent! 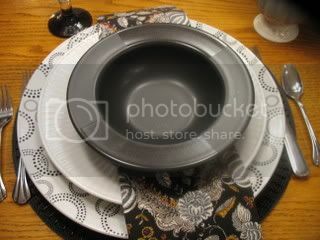 Wow, I'm impressed with this meal and this table setting. Now, if you'll PLEASE push it through my monitor, I'll enjoy my dinner. Hey there! I just found you through Carol at Meadowsweet Days. Your blog is great! I will be spending more time here peeking around. I love the look oe everything.. The lacy hearts are so pretty! 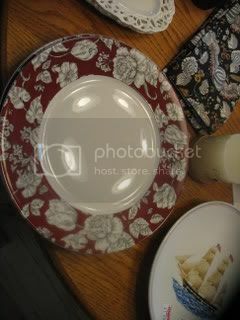 Are some dishes brown and white? I like that too! 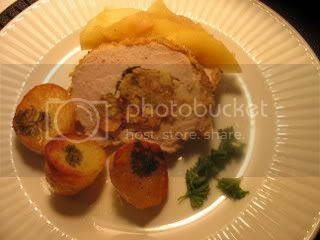 Oh that pork roast looks so yummy as do those potatoes!! Once again, presented to perfection!! 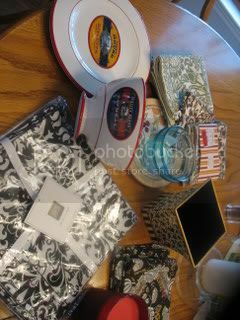 Great shopping as always, Kathleen! 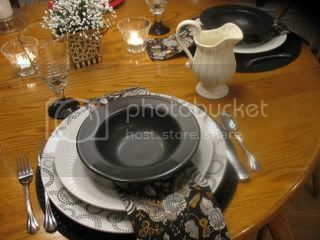 Love all the dishes! The food looks fab, too!